Toyota, Mazda and automotive components manufacturer Denso have announced details of a new joint venture intended to fast-track development of electric vehicle technologies. Mazda announced this summer that it will start introducing electric vehicles from 2019. The partnership will see the establishment of a new company, called EV CA Spirit Co and located in the city of Nagoya in Japan, which will comprise full-time engineers from all three firms. Toyota will put in 90% of the investment, with the remaining 10% shared between Mazda and Denso. The firm will develop common architectures for EVs, from Japanese minivehicles to passenger vehicles, SUVs and light trucks, while ensuring that the end vehicles retain the brands’ individual identities. Although Mazda has a hybrid version of the Axela (Mazda3 saloon) in Japan, and Toyota sells a plug-in Prius alongside its extensive hybrid line-up, neither brand currently has an electric vehicle in its range. The joint venture will also be open to other automakers and suppliers. The announcement follows the news in July that the Toyota and Mazda had signed a business and capital alliance to co-develop electric vehicles, including acquiring equivalent-value shares in each other as well as establishing joint ventures to produce vehicles in the United States. 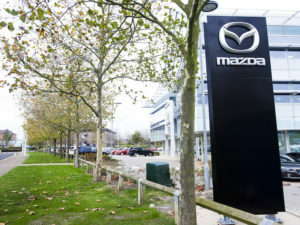 Mazda also announced this summer that it will start introducing electric vehicles from 2019, in line with its plans to reduce corporate average well-to-wheel carbon dioxide emissions to 50% of 2010 levels by 2030, and achieve a 90% reduction by 2050, although its work on reducing CO2 emissions will also continue efforts to improve internal combustion engines.